Brilliant was part of the Task Force that took part in the Falklands War, with Captain John Coward in command. During the war, her two helicopters were involved in unsuccessfully attacking the Argentine submarine Santa Fe, and she was the first Royal Navy warship to fire the Sea Wolf missile in action when, on 12 May 1982, she shot down three A-4 Skyhawks. On 21 May 1982 HMS Brilliant came under Argentine air attack outside San Carlos Water and was slightly damaged by cannon fire. On 23 May she joined HMS Yarmouth in the chase of the Argentinian supply ship ARA Monsunen. She rescued 24 survivors from Atlantic Conveyor on 25 May. Brilliant had sailed south with a pair of WE.177A nuclear depth charges on board. 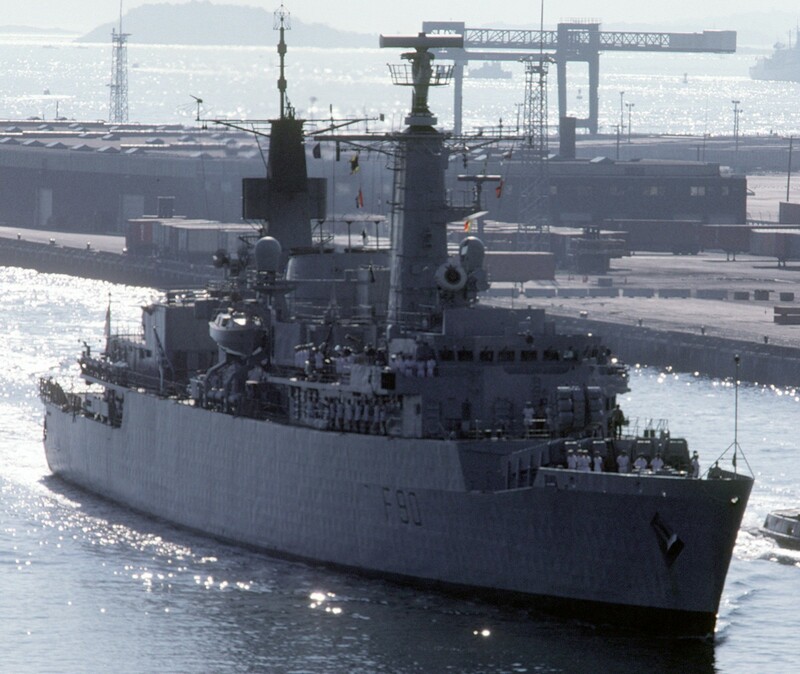 To avoid complications arising from the Treaty of Tlatelolco, these were unloaded to RFA Fort Austin on 16 April 1982. In 1987 she became leader of the 2nd Frigate Squadron. In October 1990 she saw the first members of the Women's Royal Naval Service to serve officially on an operational warship. In January 1991, "Brilliant" deployed to the Persian Gulf as part of the Operation Granby Task Force, in the First Gulf War. Brilliant starred in a BBC documentary series called HMS Brilliant - In a Ship's Company by the journalist Chris Terrill in 1994, while she was undertaking an operational tour off the coast of former Yugoslavia enforcing a United Nations arms embargo in the Adriatic sea. 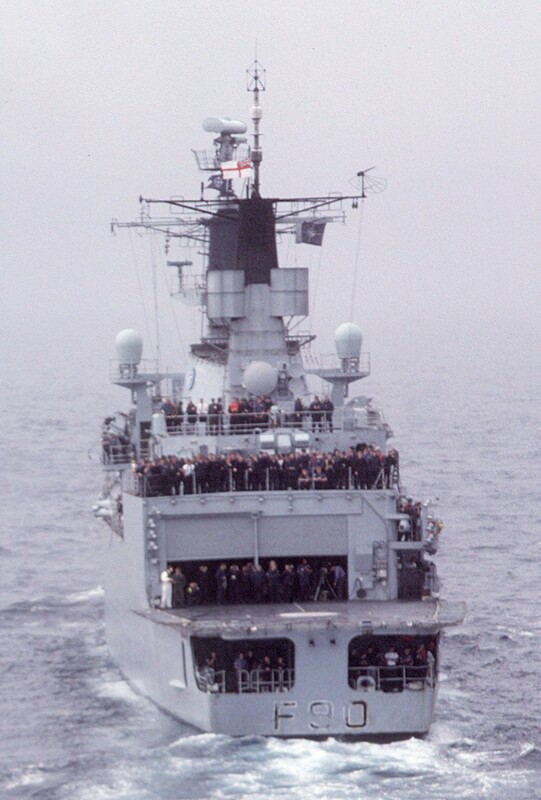 She decommissioned from Royal Navy service in 1996 and was sold to the Brazilian Navy on 31 August 1996 and renamed Dodsworth. F47 Dodsworth was sold for scrap and broken up at Aliaga, Turkey, during July 2012. The silhouette of HMS Brilliant is painted, with the date 21 May, on the side of Argentine Air Force IAI Finger serial number C-412. Also painted on C-412 is the silhouette of HMS Arrow and the date 1 May. These kill markings (without crossing) have to do with damage to both ships in the Falklands War, HMS Arrow being slightly damaged by cannon fire 1 May 1982 and HMS Brilliant also being slightly damaged by cannon fire on 21 May. Finger's markings were painted soon after the war; they were seen during the November 2005 multi-national Exercise Ceibo in Argentina, and still there as of 2007.